The piracy situation in Somalia is a terrible human tragedy. That’s why when conservationist Joni Lawrence said that it was great because it helped fish stocks to recover, people like myself and Blogfish author Mark Powell got angry. As it turns out, Joni Lawrence wasn’t just being horribly insensitive- she was wrong. So I’m not accused of slandering someone out of context, here is Joni Lawrence’s original argument. The Indian Ocean is a rich fishing ground, and many stocks are overfished. Piracy in the area makes people stop fishing because they fear being kidnapped or killed. This, in turn, allows overfished stocks to recover. Though heartless, it seems to make sense at first glance. However, a report in today’s New Scientist explains the problem with this reasoning. It isn’t just fishing vessels that are afraid to go out. Scientific and governmental monitoring vessels also fear the pirates. Also, desperate economic conditions have caused some fisherman to return to the Indian Oceans’s fishing grounds- only this time, they are taking armed guards with them in place of fishery observers.Without observers on board, fisherman may be more likely to use illegal gear and less likely to take expensive bycatch reduction efforts. Somalian piracy isn’t just a terrible problem for people, it’s a terrible problem for fish as well. For what it’s worth, my quotes were completely taken out of context. The whole piracy helping overfishing was the journalist’s idea – not mine. I don’t condone piracy and wouldn’t even if it did spare fish populations. The reporter manipulated the conversation then twisted my words to get those quotes. 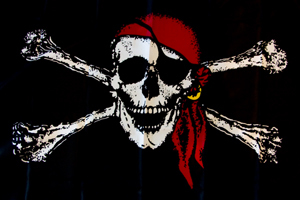 In fact the last quote “So, ideally, in a perfect world, we could employ the pirates and pay them a salary to do this(? )” was a rhetorical question asked sarcastically because the reporter had just made that suggestion. What she didn’t include was my subsequent comment that that would be ridiculous. I didn’t say eradicating piracy would boost tuna catches – I said piracy needs to be eradicated because it’s violent and populations whose economies are suffering as a result of piracy need to be supported and, as a silver lining, this might be an opportunity to not only raise awareness of overfishing but also to teach sustainable fishing practices to people that rely on the fishing industry for a living. In fact, your upcoming book sounds great. Let me know when it’s published and I’ll share the news with our readers on the blog and MarineBio.org. Piracy is not good. Scaring off scientists and government officials is a bad thing. Scientists and government officials cannot maintain fishermen’s bycatch if they are afraid of piracy. With fishermen and their bycatch they are not going to follow the laws and might make species become endanger. This is not good for the ecosystem. Piracy should be stopped.